This past Fourth of July weekend, I spent way too many hours and miles driving around the State of Florida doing nothing more than essentially going in a giant circle. 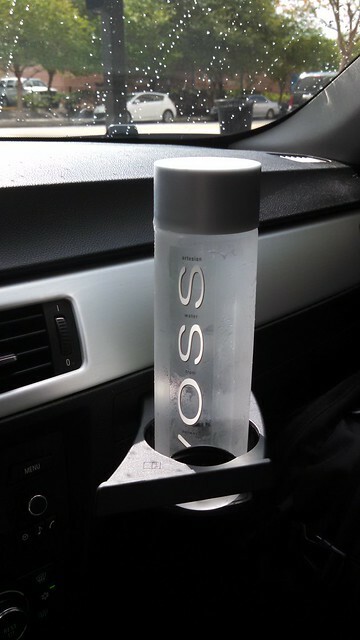 Along the way, I stopped in several cities; Orlando, Key West, Miami and Tampa. 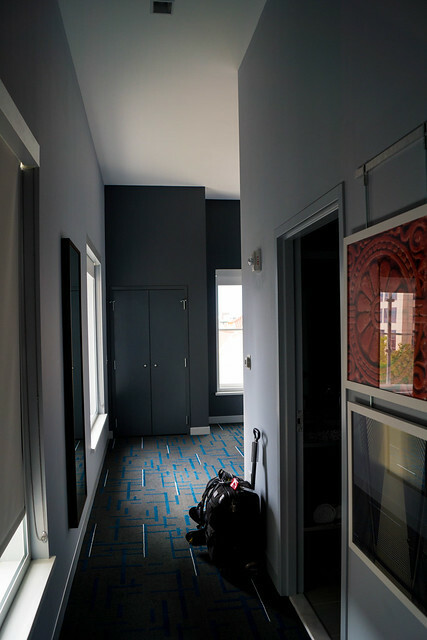 Never spending more than one night in each place, I decided to take the opportunity not just to explore parts of the state I had never traveled to in my 15 years of living here while also getting to check out some great new hotels. 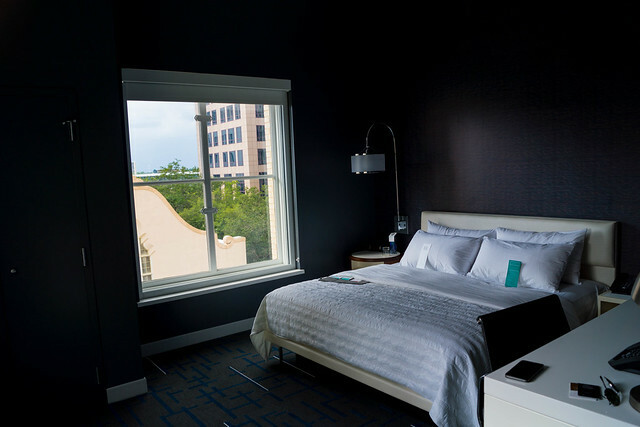 Working a bit backwards here, for my stop in Tampa at the end of my trip I found myself booking a room at the super-brand new Le Méridien Tampa. 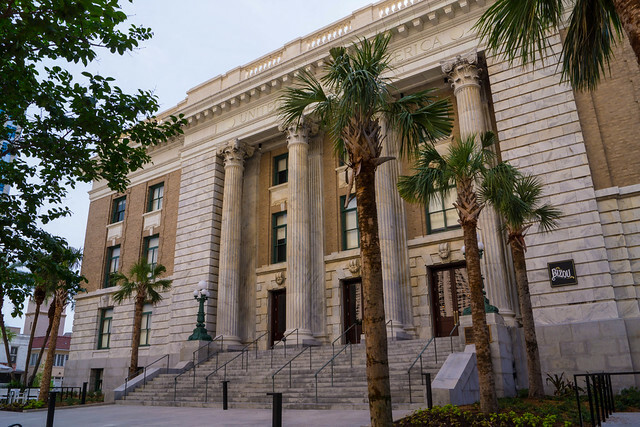 Located in what used be a US Federal Courthouse from 1905 until 2001, I first got word of this hotel towards the beginning of last year when out of boredom I had been looking through the list of upcoming new Starwood properties. 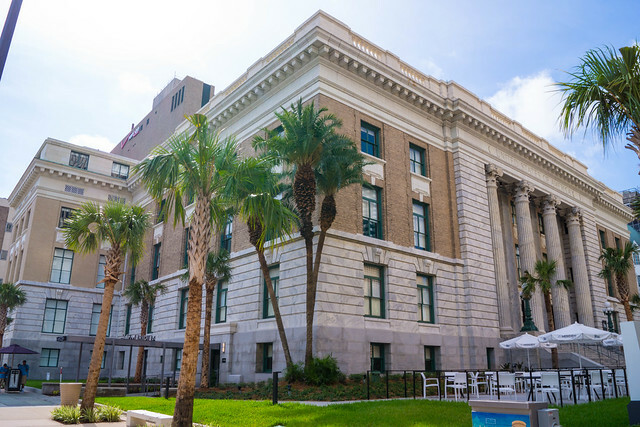 There weren’t many details at the time, but I was definitely intrigued by the possibilities of turning a former historic courthouse into a brand new modern hotel. Over time renderings of what the rooms and public areas would look like and it definitely caught my eye, but it was still the fact that they were taking this building that is over 100 years old and transforming it into a modern hotel. 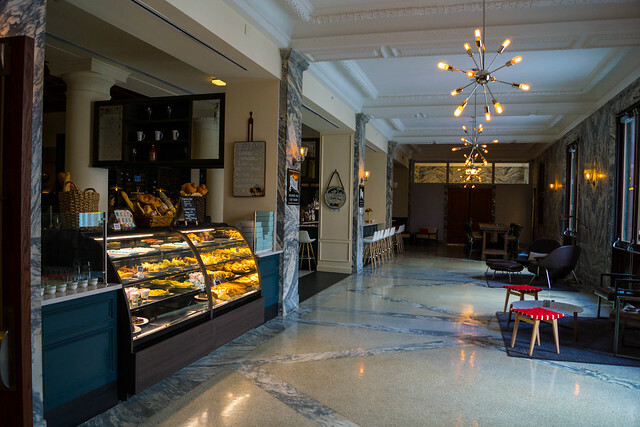 It’s refreshing to see this becoming more of the trend of repurposing and reusing older buildings like this as opposed to the 900th cookie cutter Hampton Inn or some all too-familiar glass tower. That being said, I booked my room on SPG.com less than a week prior to my arrival at a pretty decent rate of $119/night for an Executive King room. 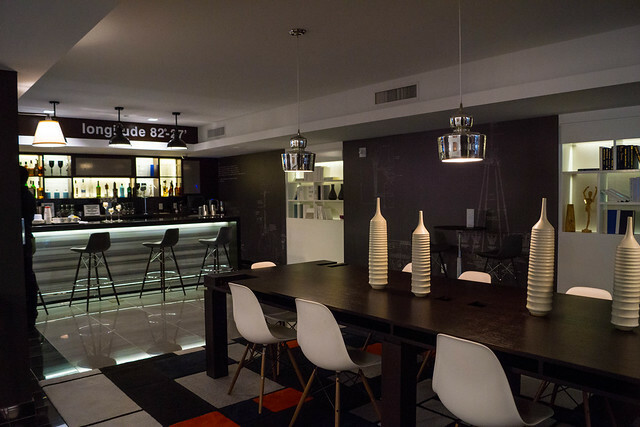 Not a bad deal by my book for a brand new hotel of the Le Méridien quality. I arrived at the hotel in the early evening, having driven up from Miami through the Everglades earlier in the day and made my way directly for the valet drop off versus looking for a lot or garage nearby; besides the valet rate is only $20/night which isn’t bad by any means. Since I was on a road trip, I arrived at the hotel in my car in the early evening and had no problem pulling up to the valet drop off on the left side of the building. Getting out of my car, it definitely makes an impression as you look at it given the architectural style; you think…is this really a hotel? It just doesn’t look like any hotel in the United States that I have ever stayed in. I’ve also stayed in “grand” hotels in Europe, including the Dom Hotel in Cologne (formerly also a Le Méridien), and while that was a hotel that dated from the 1800s, this still had a very different feel and impression as you walked up. You might see what I mean by the pictures below. Heading inside I proceeded to the front desk which is located just right inside the door from the valet drop off. There wasn’t anyone else checking in (or in the lobby), so I was instantly greeted by the front desk agent who started to process my check in. 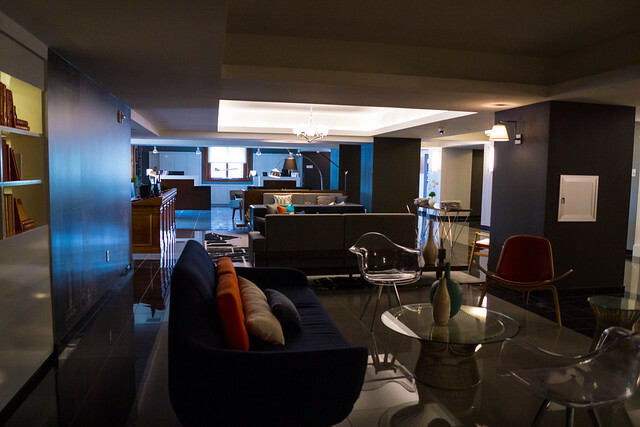 The process went pretty smoothly but perhaps a bit drawn out, but again remembering that the hotel is brand new and only had their official opening the week before and that they were probably still working out some kinks. My SPG Gold status was recognized, I was given my selection of welcome amenity (which although I nearly always go for the points, some properties just don’t ask), and I had a nice chat with the agent for a bit and one of the other hotel employees briefly about the building’s history before heading up the elevator to my upgraded room on the 4th floor. 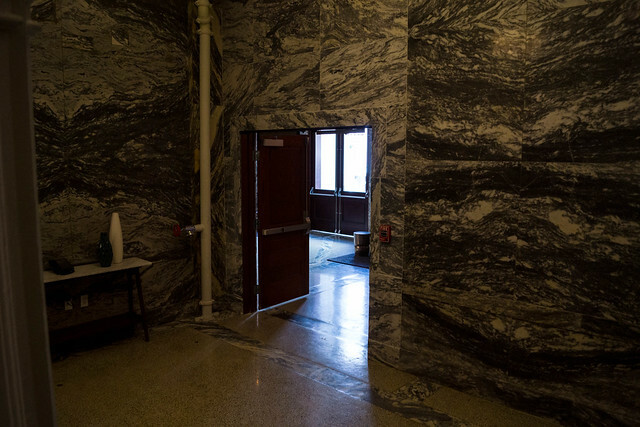 Arriving on the 4th floor, I got my first taste of the preserved features in the building: marble…everywhere. 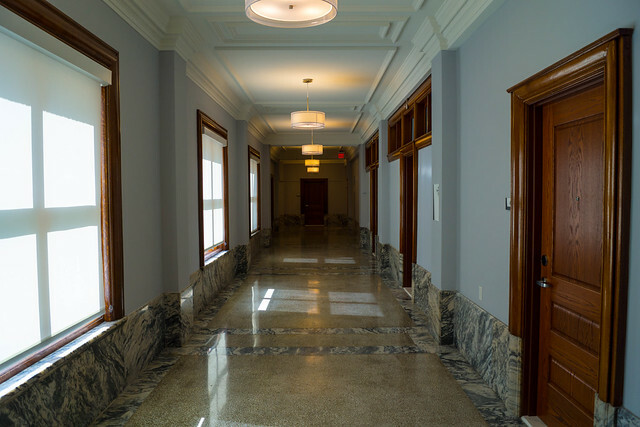 I think one of the greatest things (and unfortunately for people with rooms on those hallways), they left the marble floors that made up the wide hallways of the building in place. 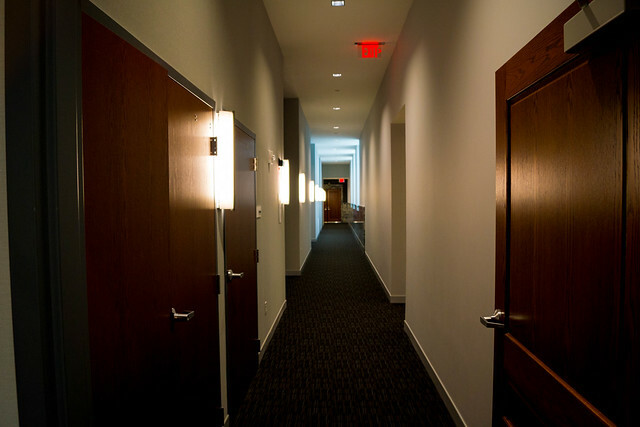 I’m sure guests who get rooms off of these hallways could find that potentially annoying, but it definitely is part of the look and feel that makes this hotel so unique. Turning the corner, I headed to my room which was in a corner of the hallway on the backside of the building; this is also a carpeted hallway and more or less looks pretty much like a standard hotel. My guess is that those areas used to be office spaces, perhaps? Entering room 415, I discovered that I had been upgraded to a corner room, and despite not being a suite, I was instantly impressed. The room had more than enough space in it and the best part was the three LARGE windows in the room that allowed so much light in. 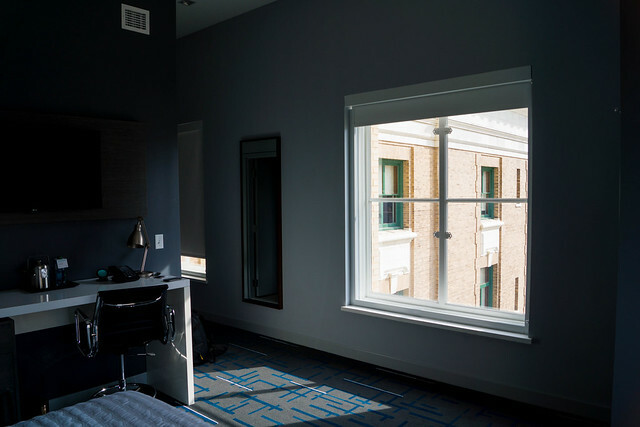 Too many hotel rooms just feel so dark and cramped and this just felt so open and light and airy (despite the fact you cant open the windows). 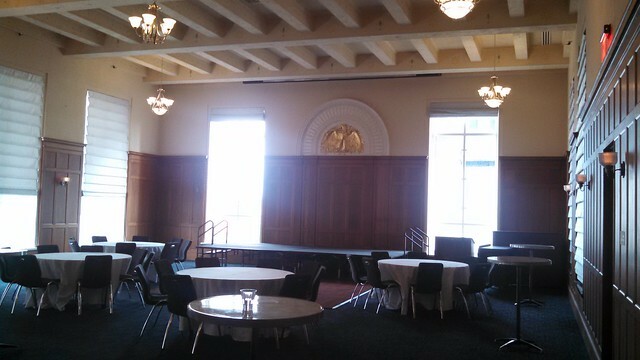 This room looked out over the main hotel entrance on the side as well as a church across the street. 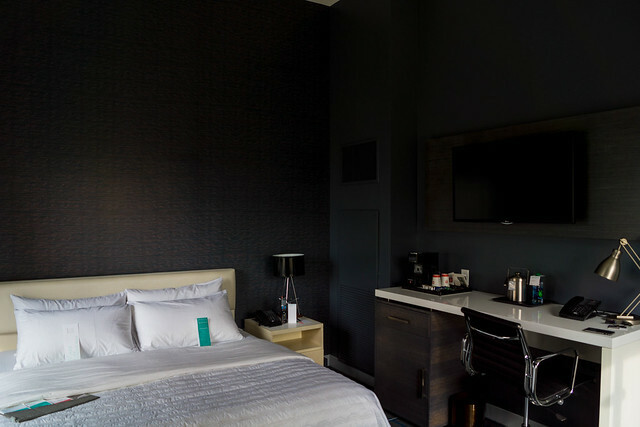 Actually, would you believe that one of the most surprising touches that Le Méridien added to the rooms was something that I found in the bathroom? 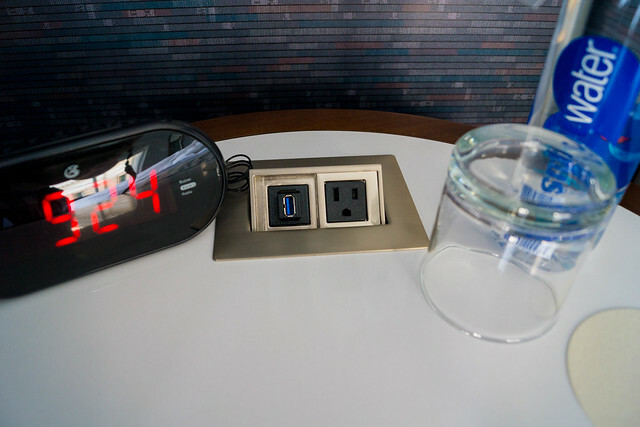 It’s something that I bet the average guest won’t even notice, but is something that I think it pretty cool. 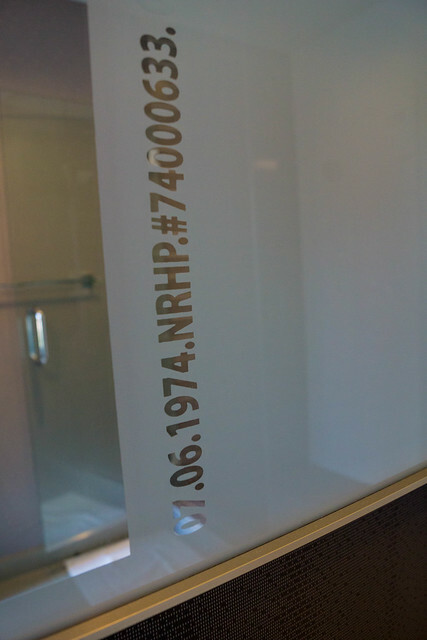 Odds are you wont guess it; in the mirror there is a string of numbers and letters that repeats over and over that says “07.06.1974.NRHP.#74000633.” Well, if you are a minor history buff like myself, you’ll recognize the NRHP part, which stands for the National Register of Historic Places; the digits after the # represent the registry number of the property and the date when it was added to the register. Another note is that this hotel has gone with RFID-based key cards; something that I’ve come across more often outside of the US versus within. Hopefully down the road, I’ll be able to use my NFC-enabled smartphone as my room key (which I think is something already being worked on at some Aloft properties). I spent a little bit of time more or less exploring the hotel’s hallways for a little bit as well. Every corner that I turned I found plenty of great examples of where they left touches of this building past in place. 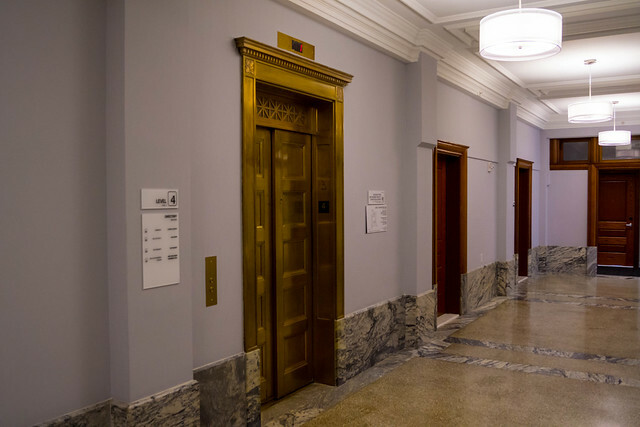 More wide marble-covered hallways, the “golden” elevator on the opposite side of the hotel, the door to the ice maker room on my floor that had been for an office in the courthouse and more. One of the other things that was neat was the stairwell that wrapped itself around the lobby elevator from the lobby to the 5th floor. 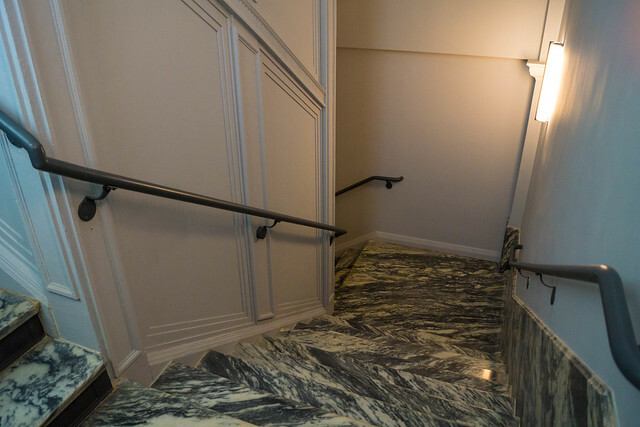 Not quite a grand staircase, but again, not something that you really see in a hotels anymore as stairs are hidden in the corner of a building and are nothing memorable. I opted to have a drink to kick off my night at the Longitude Bar off the hotel lobby to start my night off before venturing out. It was more or less your typical hotel bar and had a beer from a brewery that I had never heard of. The bartender was friendly and was good conversation for the bit I sat there. For the restaurant however, I did go there for breakfast the next morning. Bizou Brasserie counts itself as a French bistro and bar (although perhaps not so much for breakfast?) 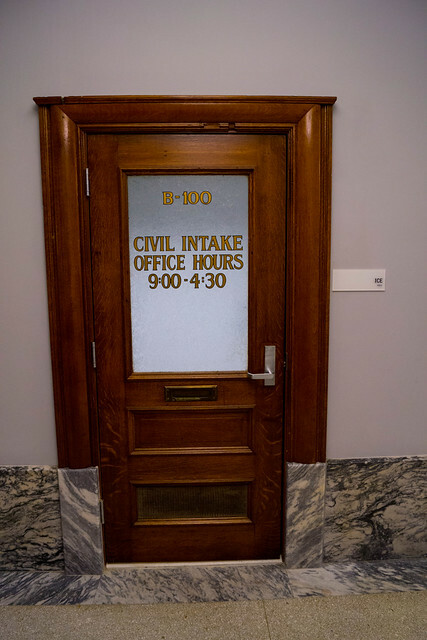 and is located on the second floor of the hotel or just up the steps on the front of the building and through what would have previously been the main entrance to the courthouse (I assume). The menu had plenty of options for breakfast and it came down to their French toast (boring, right?) 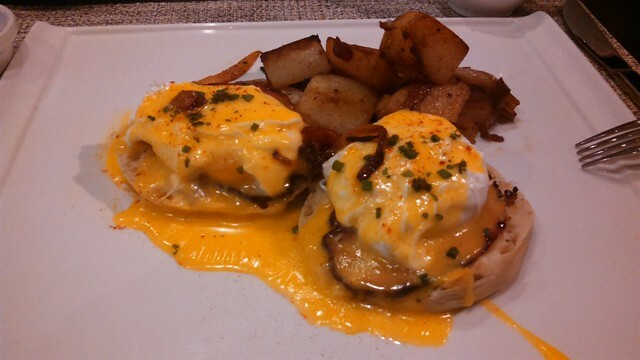 or the eggs benedict. Eggs benedict seems to be something that is more or less a standard one can use to gauge a place’s ability to make a decent breakfast. I have to say it was perhaps not perfect, but pretty close. There were not an excessive amount of hollandaise sauce used (unlike the restaurant at the Nines in Portland), the eggs were poached perfectly, and the potatoes on the side actually were seasoned nicely. The server made sure my cup of coffee never ran out and made sure that I was taken care of, without being too pushy about it or checking every three minutes. It was probably one of the better hotel breakfast experiences that I have had. Just outside the main restaurant area is the bakery portion which had all sorts of good looking things in the display case. 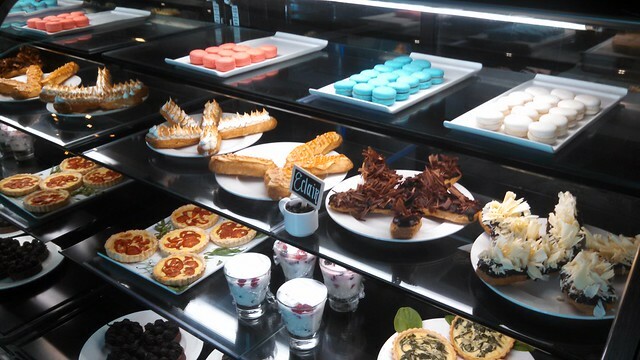 Pastries, éclairs, macaroons, quiches, the works. What really drew me in though were the éclairs; they had four and two of which appeared as if an explosion of chocolate had been frozen on top and the other two had more subtle looks. I opted for the one in the middle which I believe was a salted caramel éclair. 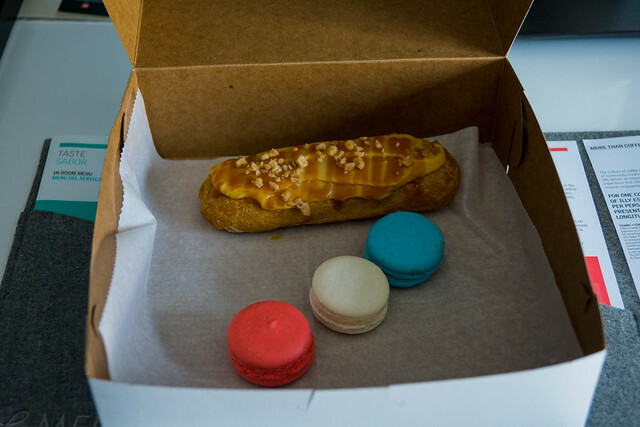 I also got myself one each of the three types of macaroons (red, white and blue), because…’merica. 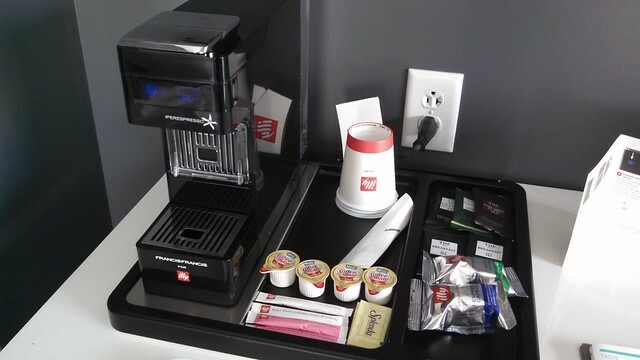 Total was a bit on the pricier side of I think about $13, but let me tell you they were tasty enough to be worth that much when I got them back up to my room and promptly devoured them with a cup of espresso from the illy single serve espresso machine in the room. I sincerely hope that the over time as the hotel gets farther away from the grand opening that the staff does not become complacent, because all of my interactions with the staff was nothing short of great. I’ve touched on some already, but to expand on those other experiences let’s look at these facts. After drinking my beer at the Longitude Bar I wanted to head out for dinner, but didn’t want to go to Ybor City and quite honestly nobody goes to downtown Tampa for really anything, so I was expecting not many options. I consulted with the front desk agent who checked me in and brainstormed several ideas, all of which would be within walking distance of the hotel. As I stood there, it really started to rain, and walking anywhere was going to be out of the question. An umbrella was retrieved for me and not too much longer they had the hotel van waiting out front to take me the two blocks to a pizza joint (hey, it was really coming down that night – like a “flash hurricane”) for dinner. The next morning at check out, which was a breeze, the agent helping me then was also nothing short of courteous and friendly as well. He made sure that there had been nothing wrong with my stay, shook my hand, then grabbed me a bottle of water to go for my journey back home. 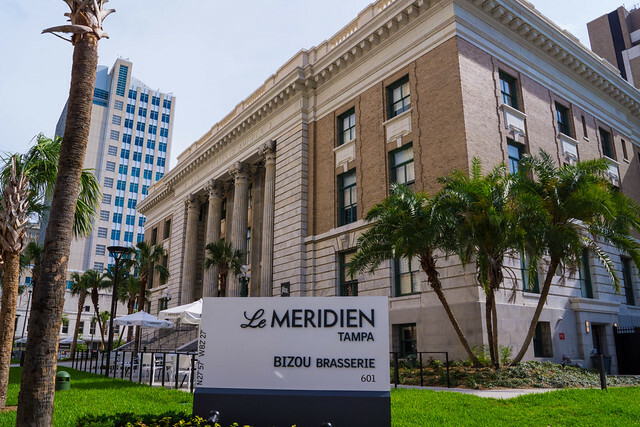 The Le Méridien Tampa, although located in the less-than-happening downtown Tampa, is an awesome hotel that is definitely worth a stay for folks visiting the Tampa area. While the general area does not have a lot of options at night, I found several bars downtown that had either impressive cocktail selections (Anise) or beer selections (Taps) and I’m told the main hotel bar on the 2nd floor has been doing pretty well. 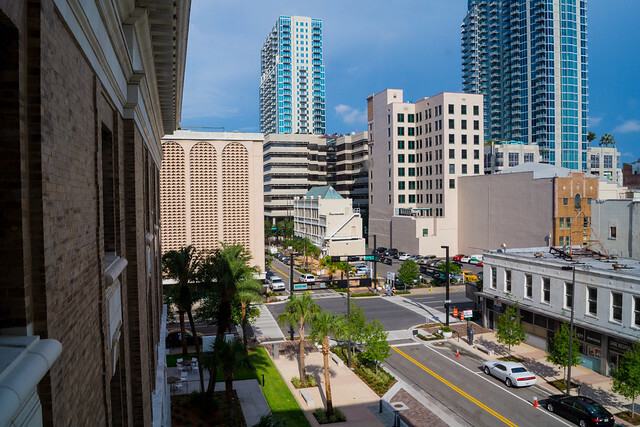 It’s going to probably still be a while before downtown Tampa really takes off, but it seems that this hotel is going to be a good anchor for that transformation whenever it does happen. I was very impressed with this hotel from all aspects and would certainly be staying here in the future should I head back down to Tampa. In fact, with UCF playing USF in Tampa later this year, I think I might just need to make a reservation. This entry was posted in Florida, Hotels, SPG, Trip Report. Bookmark the permalink. Follow any comments here with the RSS feed for this post. Post a comment or leave a trackback: Trackback URL. Staying in this hotel tonight. It is fantastic – highly recommend it. Great bit of history you wouldn’t expect in this southern city.